Your business is growing rapidly in multiple locations. Your core IT team works day and night to get deployment ready IT together for all the employees at the new offices. But your corporate headquarters is a mess — hardware boxes are strewn everywhere, and everyone is having a hard time focusing amid the chaos. Even when the equipment is ready for your new employees, there’s still the burden of logistics: kitting, packaging, shipping, and tracking. With a remote workforce and an ideal IT partner, this scenario doesn’t exist. Instead, your everyday business operations are not interrupted by growth. You trust your IT partner to ramp up — and they’re ready for the challenge. They have the energy and process in place to take care of what needs to get things done. And you don’t have to worry about it. You just get confirmation that the work is moving along smoothly. It’s important to have remote offices fully functioning for the health of your business. How does an internal IT team fully meet the IT needs of a remote workforce and remote team? For starters, it requires more tech infrastructure, IT support staff, and greater logistical coordination. Yet, your internal IT team can’t be everywhere at once. A remote staff demands an IT partner that can handle complex logistics, including shipping systems to multiple locations, and providing deployment ready IT. While supporting remote teams doesn’t require an entirely different skillset, there are unique challenges that need to be addressed. Security issues: With a decentralized workforce, there are more security risks. Devices can get infected with malware that could then infiltrate your company’s network. As an article in Entrepreneur titled “How to Maintain Security When Employees Work Remotely” notes, “When data disappears, financial, legal and reputational problems can quickly follow.” One way to mitigate harm is to work with a skilled IT partner that can provide user ready IT to every location, while also ensuring you’re audit-proof. The Entrepreneur article also advises that a business could use a cloud-service provider because it’s “often better equipped and staffed to lock it down.” If your business becomes automated, then there will be more data to protect. You can never have too much security. Mindful leadership: You’re not thinking forward. You are caught by surprise every time your business gets a new acquisition. With mindful leadership, you are following your business’ growth trends. You are fully aware of the expected growth in the forthcoming months. You have a plan and your IT partner is covering the foundational details. A remote workforce needs to be managed differently. The Harvard Business Review advises to hire the right people, focus on outcomes, help employees choose their own adventure, and centralize thoughtfully. Maintaining consistency is key, and setting consistent outcomes moves the focus from delegating and micro-managing to strategizing and problem-solving. Open lines of communication: Imagine new employees sitting at their desk, unable to work because they haven’t been provided deployment ready IT. What a waste of time, resources, and people power. In the Harvard Business Review article “How to Manage Remote Direct Reports,” Keith Ferrazzi, the founder and CEO of Greenlight, advises to “set an appropriate cadence of communications.” Ferrazzi says, “If you, the manager, don’t create good, open communication channels, the remote worker will feel, well, ‘remote’ and forgotten.” Now, envision a future forward, flexible workplace where employees have constant, easy access to the connected technology that helps them work their best. You trust your IT partner to remotely access your IT systems in order to ensure your technology is fully functioning. As your company grows and scales, the right IT partner can help you acquire and implement innovative technological tools that foster open lines of communication amongst your staff across locations. 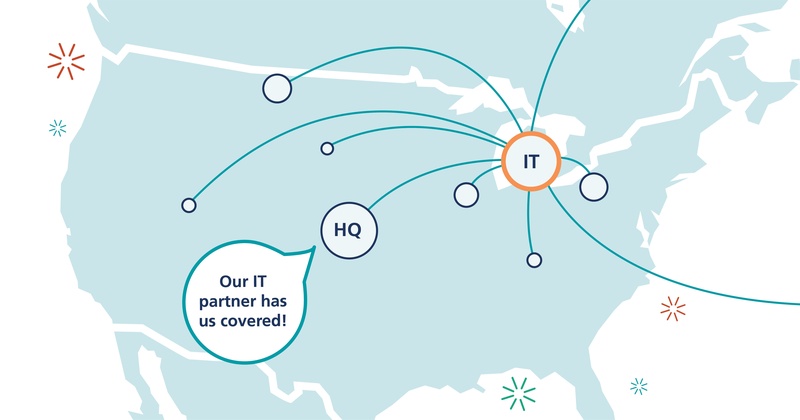 IT experts at DCC have been helping businesses across industries manage their remote teams. Contact us today to learn how you can manage remote user satisfaction.